A warning regarding the dangerous path followed by Brazilian democracy. 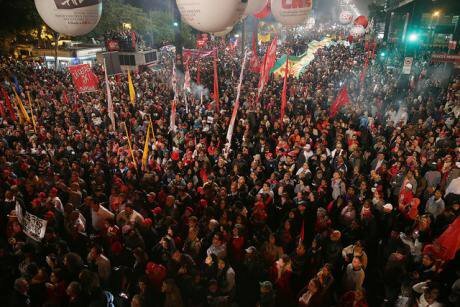 Lula Day, Act for Democracy, in Sao Paulo, Brazil. July 20, 2017. Flickr/PT. Some rights reserved. President Dilma Rousseff’s removal on 31 August 2016 initiated an attack on Brazilian democracy. This attack reached a second milestone on 1 September 2018, when former President Luiz Inácio Lula Da Silva, a favourite in Brazilian presidential election polling for the elections on 7 and 28 October, was disqualified from running for office. As a result of both actions, Brazilian citizens face the dangerous prospect of a possible victory by a fascist, racist, chauvinist and homophobic candidate, one who calls for violence and armed repression. We are drawing attention to these two illegitimate attacks. Firstly, a parliamentary attack against President Rousseff. And secondly, Lula’s sentencing without proof to 12 years in prison, as well as his disqualification from running for electoral office. These are steps to prevent the Brazilian Worker’s Party (PT), to which both Rousseff and Lula belong, from implementing a plan for the redistribution of wealth and the reduction of social, racial and gender inequality. For the past 16 years, this plan has served as a successful example of an alternative to neoliberalism responsible for the global crisis. We are profoundly concerned about the consequences of illegitimately facilitating the Brazilian presidential victory of a fascist candidate. They would reverberate both within the country and across the international stage, where extreme right-wing leaders are on the rise and even govern, via voting marked by frustration with the 2008 crisis and neoliberal austerity. So that society can peacefully accept the results of the elections on 7 and 28, there should be a guarantee of just competition among all parties, including the PT." Celso Amorim, former Brazilian Minister of Defense and Foreign Affairs. Renata Avila, Director of Ciudadanía Inteligente Foundation. William Bourdon, Human rights lawyer and Founding partner of Bourdon & Associés. Pedro Brieger, Director of NODAL. Noam Chomsky, Professor Emeritus at the Massachusetts Institute of Technology (MIT). Gaspard Estrada, Executive Director of OPALC, Sciences Po. Baltasar Garzón, Jurist and President of FIBGAR. Rafael Heiber, Executive Director and Co/founder Common Action Forum. Alexander Main, Director of International Policy, CEPR, Washington, DC. Pierre Sané, former Secretary General of Amnesty International and President of Imagine Africa Institute. The Brazilian elections will take place next weekend. The extreme right candidate is leading the polls.